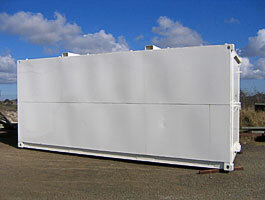 The Great Western Manufacturing Explosives Magazines comprises a range of modular designs with common doors, ends, venting systems and hold-downs, to cater for explosives, detonators, ordnance and other hazardous goods. Nominal storage capacities include: 500, 1000, 2000, 5000, 7500, 15000 Kgs. Standard pallet size access door is fitted to the 7500 Kg and 15000 Kg. 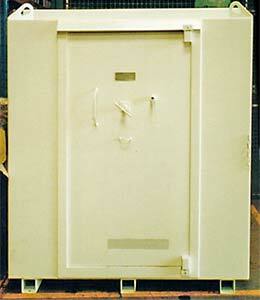 10mm thick steel door fitted with a 3 bar locking device. Six lever "Ross safe lock" is fitted. Full roof and door ventilation systems are fitted. Interior has fully coated 12mm thickness timber lining. Interior has 75mm thick non-combustible insulation to facilitate a lower internal temperature to assist with a longer product/ordnance shelf life. A computerised key register is recorded "in house". Aluminium serial/compliance plates are fitted (1 x exterior & 1 x interior). Special Transport Kit for 7500 Kg & 15000 Kg Magazines is available for container crane handling at seaport wharves. Optional self-draining modular shade roof is available. Note: Above dimensions are external measurements and all capacities are nominal. All Great Western Manufacturing explosives magazines are manufactured to comply with the relevant requirements of the Australian Standard: AS2187.1-1998 and to Quality Assurance Accreditation: ISO 9001.